We're helping Hoyt hit the mark with a new responsive website. Hoyt has long been a technological leader in the archery industry. We wanted to build a website for it that was technically sound, easy to use, and adapts to all users. Just like its bows. Hoyt is a pioneer across multiple markets in the archery business and needed a site that can cater to bowhunters and 2 different types of target archers. We built a site that allows for segmented content, and tracks visitor's browsing habits to make sure they are getting the content that is most important to them. Hoyt offers hundreds of compound bow configurations. Being able to show the variety of options available to archers was a must in this project. 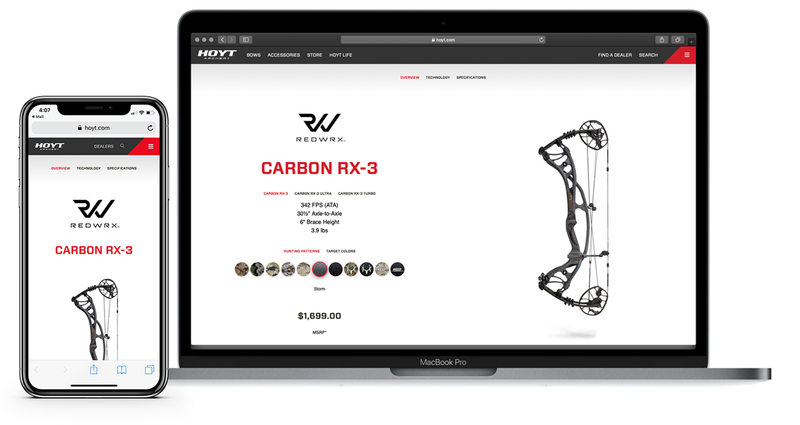 We built a system for Hoyt that allows users to view compound bows in all the various options, complete with imagery, so the user can see what they're getting before they buy. Despite the fact that archery is one of the oldest traditions in the world, modern archery is changing at a rapid pace and continues to do so. We wanted to build a site that is flexible and can adapt to the needs of this industry on the fly. We built Hoyt's new site on the Symfony2 framework because it allows us the flexibility and the tools to fully customize the front end and the content management system to fit the client's needs. Archery is a worldwide sport. From elk hunting in big-sky country, to field competition in Europe, archers have one thing in common: They love to share their accomplishments. When Hoyt came to us looking for a news solution that would not only get its message out, but also give its customers a voice in the conversation, we developed a custom Tumblr integration that did just that. Using the Tumblr API and blogging tools, Hoyt now has a platform to share news, content, and video around the world with its fans. Getting the chance to work with an industry leader like Hoyt on such a large-scale project is amazing. Over half of Hoyt’s website traffic views their site from mobile devices. Now, Hoyt’s loyal fan base can effectively dive into their bows and technology from any device.